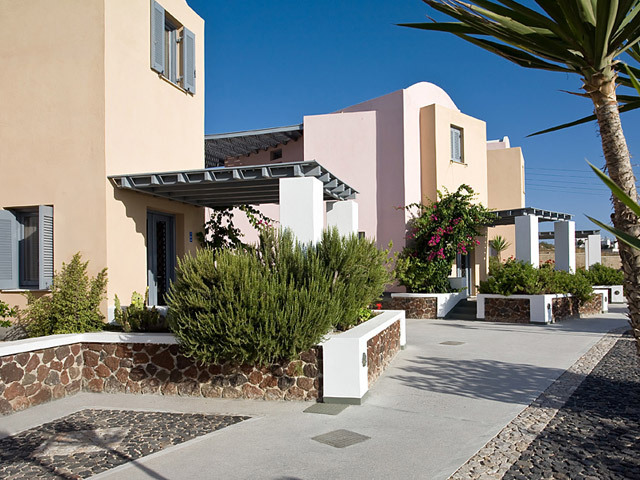 Located in the area of Akrotiri, Avant Garde Suites give justice to their name. 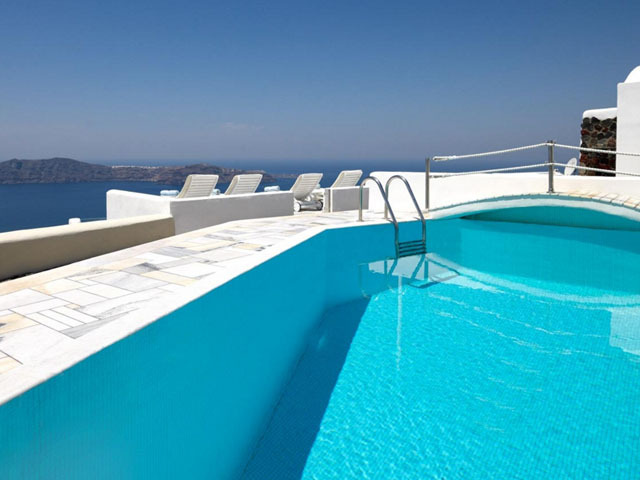 Offering an amazing view of the caldera and a panoramic view of the island, these nine deluxe suites have a color and style of their own. Ultra modern, chic, attention to detail and clever gadgets take you beyond luxury. Fun colors, funky, signature design furniture (Philippe Stark, Karim Rashid, Fabio Novembre ...) give out a sleek, chic and exclusive design led hotel. Most of the suites offer private Jacuzzi for moments of sheer relaxation. The Funky Lounge area with the large pool, the comfy sofas and the Alain Gilles Light chairs is the focal point of the Hotel. Take a dive and enjoy the amazing view of the island while relaxing in your loungers and sipping your cocktails from the Cool Booze&nbsp; pool bar. 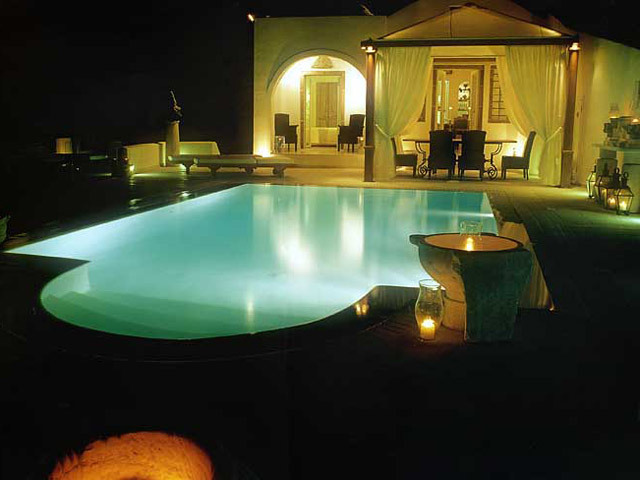 Avant Garde Suites creates in every way, an ambience of luxury, ultimate pampering in a very hip, shape based way. Each suite has a different dominant color and all the decoration style is about strong lines combined with soft curves that create a unique equilibrium. Akrotiri is an area located 12 klm from Fira (the centre of Santorini) offering a panoramic view of the island.The area was rich in findings during the excavations which have unveiled a rich Minoan civilization, with various artifacts and frescoes you will now find in the Archaeological museum of the island. Akrotiri is a private area, preferred by the locals and very close to the famous Red and White Beaches of Santorini. A fortified Venetian castle, very well preserved dominates the area as well as the stunning view of the Caldera and of the villages of Imerovigli and Oia. Simple but not simplistic, stylish and spacious, the Junior Suites offer a living area, with cozy sofas, working desk with laptop and wireless internet. The bedroom offers a double matrimonial bed with Latex mattress and flat screen TV. In your large balcony you will find a double day bed for moments of sheer relaxation with lots and lots of pillows for you to soak the rays of sun and to enjoy a rich fresh-made breakfast, an afternoon cocktail or a romantic candlelight dinner under the stars while facing the night lights of the famous Caldera. Luxury cotton-satin bed linen and microfibers duvet. Alternative goose-feather bedcover. Color, style and lots of space describe these suites with some of them offering a private Veranda. The large living area has comfy sofas, a large flat screen TV and a working desk with laptop and wireless internet. The bedroom is equally spacious offering King size bed with Latex mattresses for a heavenly sleeping experience. But the area you will spend most of your time is the large private terrace with the outdoor private heated Jacuzzi and the comfortable double day bed. There you will also enjoy your rich American Champagne Breakfast, a light lunch or a private candlelight dinner facing the most photographed sunset of the world. En-Suite Bathroom with shower dressed with Glass Mosaic and "Stucco Technique"
Upon arrival your luggage will be taken to your Suite, where you will find a complimentary bottle of champagne to welcome you. To further compliment your stay, a very rich American Champagne Breakfast will be served each morning, the desired time, in the privacy of your own terrace overlooking the sea.